Pat Regan has created a fully functional replica of Captain Nemo's diving suit - the Nemosuit. 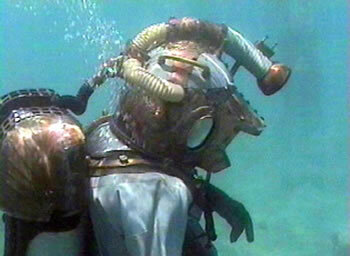 It features a drysuit and boots that were made by the manufacturers who supplied the original suits to Disney for the 1954 move 20,000 Leagues Under The Sea. Some portions were handmade by Regan, the rest is vintage equipment used by Disney in the movie. The site has a number of pictures, including photos of the original suits in action at Disney studios in the early 1950's. Read a quote about Jules Verne's diving apparatus; find more information at The NEMOSUIT and Regan's website.